A few epic events below to begin your Monday morning. Enjoy..! He really threw down! Kam started the night with an old skool set around 10:30 which included songs like ABC, Thriller, Footloose, I Wanna Dance with Somebody, Respect, You Shook Me All Night Long, and many more. That intro led him right up to his 90's set starting around 11:00 including songs like It's Tricky, Cotton Eyed Joe, Whoop There It Is, This is How We Do It, All the Small Things, Just A Friend, and Good Vibrations. Moving along later into the evening and getting much closer to midnight, Kam turned the tempo up for the last thirty minutes, and leading up until the clock struck midnight, he played the hottest songs of 2017. Right after the epic countdown and champagne toast, he kicked 2018 off with Kendrick Lamar's Humble which had the whole crowd rapping to every word! Kam continued to throw down the rest of the night, playing the hottest hits in hip hop, pop, indie, and electronic from the year past, until he shut the bar down at closing time! Aside from the music, we also provided a custom designed Snapchat geofilter which got over 8k uses by guests in and around downtown Nashville for New Years Eve! It's easy to say this was a successful event and one that we look forward to being a part of again in the future! Cheers! Below are photos from two separate, private corporate events that Brad Ford was our team lead for over the holiday season! You'll see some of our most popular services at work; from up lighting placed around the perimeter of the room, to Brad's clean + neat DJ setup, dance floor lighting, and additional up lighting thoughtfully placed on the stage as well. The custom lighting in combination with the decor really added a festive flare to both celebrations! Brian's annual NYE party thrown at only one of our most favorite venues in town, Mint Springs Farm, has become as much of a tradition as it is a really fun party. And by really fun party I mean really fun party. There's never a shortage of throwback jams and margs, and certainly never a shortage of good laughs behind the photo booths. 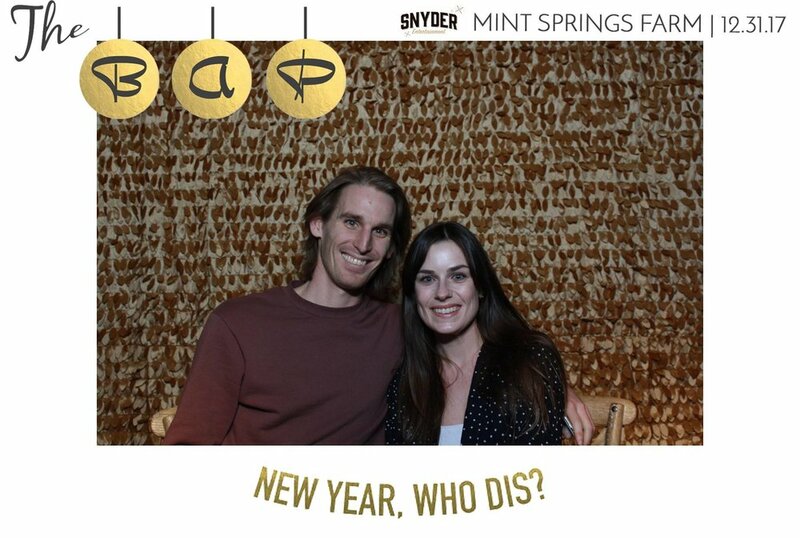 This years party included a custom Step & Repeat Banner, two custom design photo booth templates, a custom designed Snapchat geofilter, and easily the coolest service of the night: music videos playing in real time as the actual song plays over the speakers onto the dance floor. I know right, I'm not kidding and when Brian pressed play on his first music video meets song combination, my husband and I stood there with our mouths hanging wide open for at least the first verse and full chorus. It was wildly intriguing and entertaining to both those dancing and those still seated at their tables. Which reminds me, that would be a great option for upcoming weddings; remember not everybody has the ability to or wants to dance for a minimum of two hours at your reception! But back to my point, this years BAP was one to remember. Thanks, Brian. To book your next event with Snyder Entertainment, please contact us today. #nashvillevents editoral: Come on Everyone, It's the Millenium..